Some friends recently returned from a short visit to New York, while other friends are currently visiting the big apple as we speak. I am jealous. I miss New York. When I think about their fun travels eating their way through the city my mind instantly drifts to doughnuts. If you’re in the city it is undoubtedly Doughnut Plant, but if you’re in Brooklyn then you go to Dough– they fry in Bed Stuy. So doughnuts have been flooding my thoughts of late. Specifically the fluffy fried delights from Dough. That spring back texture, that supple dough, that sweetness. If only I were in Brooklyn to enjoy these doughnuts. But since I am not, I needed something to quell my aching need for Dough. 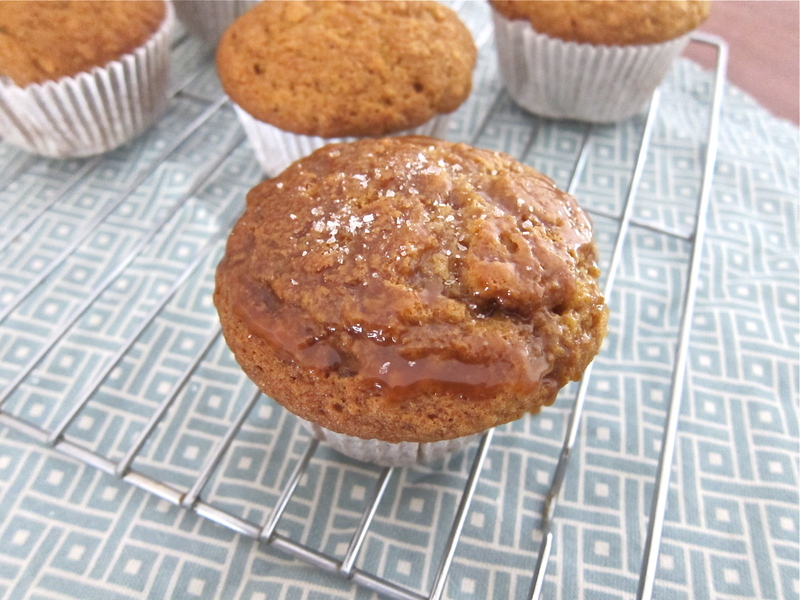 This morning I bring you Dulce de Leche Doughnut Muffins. Why? Because Dough serves a dulce de leche doughnut and that is exactly what I wanted this morning. Rich sweetness, tender dough, strong caramel tones and a touch of salt to round it all out. 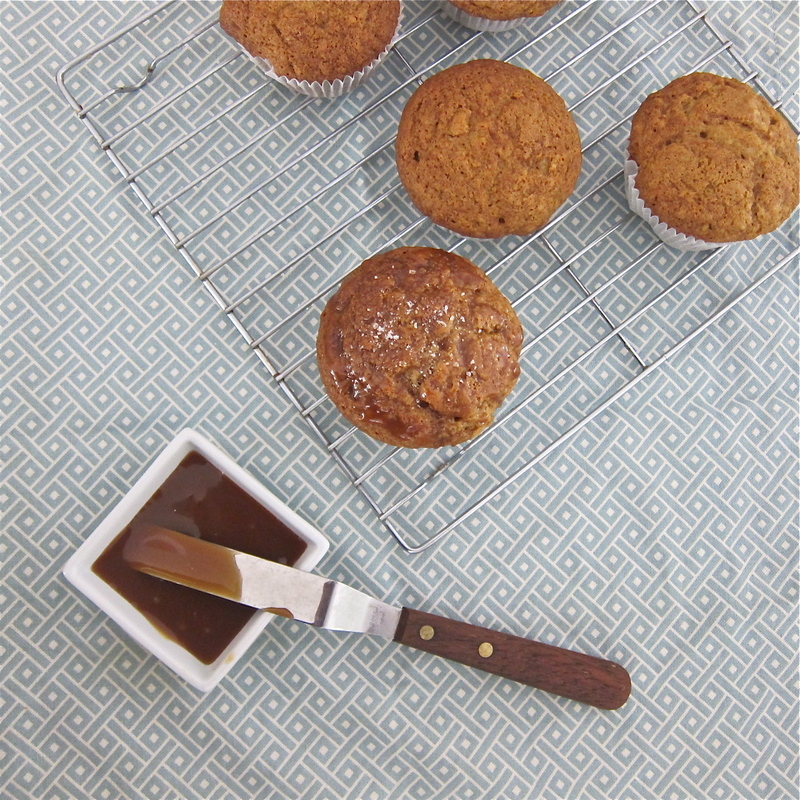 These defintiely don’t beat Dough, but these muffins do satisfy a dulce de leche craving. Place racks in the center and upper third of the oven and preheat to 350 degrees F. Line two cupcake pans with paper or foil liners. Set aside. In a medium bowl, whisk together flour, cornstarch, baking powder, baking soda and salt. Set aside. In the bowl of an electric stand mixer fitted with a paddle attachment, add butter and sugars. Beat on medium speed until fluffy and pale brown, about 3 minutes. Stop the mixer, scrape down the sides of the bowl and add one egg. Beat on medium for one minute. Add the remaining eggs, one at a time, beating for one minute between each addition. Stop the bowl and scrape down the sides as necessary. Beat in vanilla extract. Add half of the flour mixture to the egg and butter mixture. Beat on low speed and slowly drizzle in the buttermilk. Beat until just incorporated. Stop the mixer, scrape down the bowl and add the rest of the dry ingredients. Beat on low speed until just incorporated. Remove the bowl from the stand mixer and finish incorporating with a spatula. Gently fold in dulce de leche. DO NOT to over mix the mixture. Divide the batter between the prepared muffin pans, filling each liner about two thirds full. Bake for 18 to 20 minutes or until a cake tester inserted in the center of one of the cakes comes out clean. Let rest in the cupcake pans before removing to a wire rack to cool completely. Mint- A Fresh Look at Summer! Hooray! Another recipe I can get behind! I love dulce de leche and I love that you are turning a donut (doughnut?) into a muffin. When can I come over for a Muffin Monday?? Deliciously naked version of cupcakes 🙂 Enjoy these little guys without the guilt.